This week is the California Association of REALTORS® (CAR) EXPO in San Jose California. 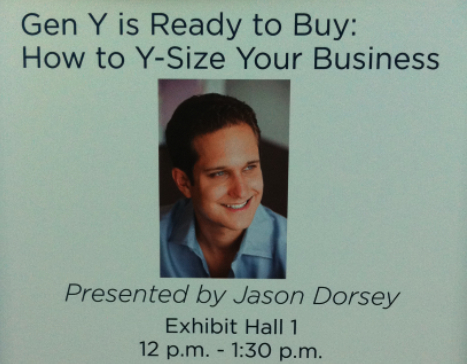 One of the luncheon speakers this year was guest Jason Dorsey, a recognized “Gen Y” representative who spoke to the group about how Gen Y IS ready to buy. The information Jason shared in a more than enthusiastic and exciting manner was well received by the audience but more importantly was “DEAD ON” regarding the Gen Y culture and mentality. If you were there, you know exactly what I’m talking about and if not… I’m sorry you missed out. Here’s a few short minutes of Jason’s presentation that will give you a small dose of Jason’s knowledge, humor, and accuracy of the “Generation Y” that’s ready to buy. Listen closely to what he says regarding trust, tech savvy, communication, experts, and who the most trusted website is for Generation Y. Is there a gap between “Gen Y” and YOUR generation? Do you feel that “Gen Y” speaks a different language, dances to a different beat, or thinks differently than you or I might think? Have you looked at the numbers, done the research, and considered some of the facts surrounding the “Y” Generation? Once you see this, you’ll realize that the tools available can and will make a difference if you decide to seize the opportunity. Why should you care? Your future business may depend on it.